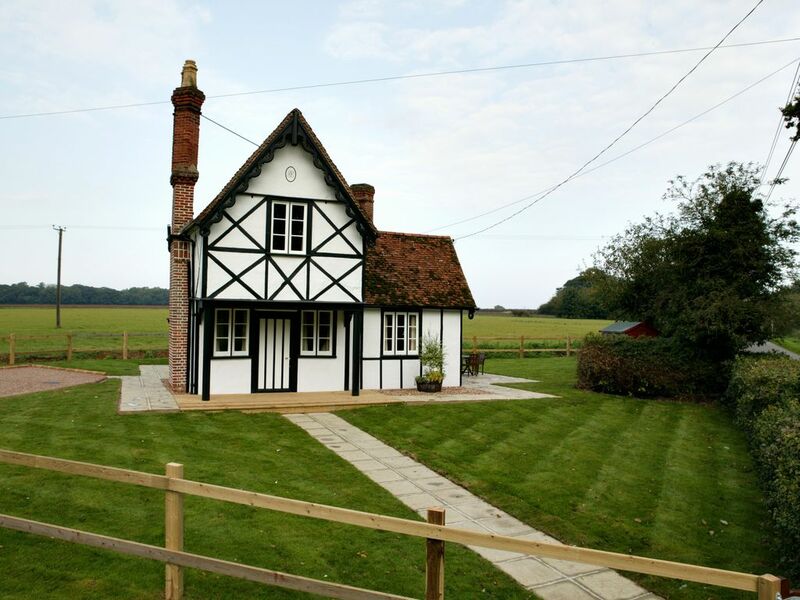 North Lodge is a refurbished and immaculately maintained 2 bedroom timbered cottage with comfortable and spacious living spaces and excellent facilities. Sleeps 4. Bedrooms: 2x double ensuite bedrooms with showers (no bath in theproperty). Full kitchen inc. fan oven, grill, fridge, dishwasher, crockery, cutlery, washer-dryer. Lounge with sofa and armchair, Freeview TV & DVD player, Free Wifi allowance (subject to monthly limits set by the ISP), patio, private garden overlooking the fields. Free Parking on site. Pets welcome (extra fees apply). Picture perfect whitewashed former farmers cottage in the heart of our rural Estate. Renovated to the highest standard North Lodge is a comfortable and easy place to stay. Surrounded by private gardens the cottage is both spacious and private offering top-quality accommodation in the heart of stunning rural North Essex. Fully fitted kitchen and living areas means you can relax in a home from home with Freeview TV and free Wifi (monthly ISP limits do apply). Luxurious bedrooms and top-of-the range bathrooms give that luxury feel to make your holiday extra-special. Situated on the Estate off a quiet rural road only 1 mile from the centre of the picturesque village of Finchingfield. With easy access to footpath walking on the Spains Hall Estate and delightful pubs, tea rooms and local deli within Finchingfield (10 mins walk). Further afield you are within easy reach of historic Thaxted and the thriving market town of Saffron Walden with the full range of amenities. Spains Hall Estate is a family run business and our holiday cottages have been lovingly renovated to give them a new lease of life. The Lodges have been part of the Estate since they were built - their heritage is our heritage! The Ruggles-Brise family have lived at Spains Hall since 1768, only the 3rd family to live here since 1086. Only self-catering in Finchingfield. Access to estate walks, pet friendly. Ground floor is reasonably wheelchair accessible with a paved path and decking (no steps) from the gravel parking area. Step-free access to living room, dining room, bedroom 2 and en-suite shower room (no no shower or mobility aids, step up into shower enclosure). Steps down into Kitchen. Staircase to 1st floor bedroom. Notes on accommodation: We do not permit smoking. We regret that we cannot accept guests under the age of 21, except as part of a family group accompanied by parents/guardians. The cost of all heating and hot water is included in the price, as is free Wifi download (subject to monthly limits set by our ISP). Pets permitted (extra fees apply). North Lodge maximum persons permitted 4, South Lodge maximum persons permitted 4. Outside: All Lodges have private gardens - North Lodge offers a fenced garden with decked area and wooden garden furniture and gas patio heater. South Lodge has a fenced garden over-looking open fields and a south-west facing conservatory, perfect for those summer sunsets. Fantastic location just a short walk into village for several nice food & beverage options. Lodge overall pretty good, but beds & chairs might be due for upgrade in comfort to get 5 stars. Thank you for taking time to review your stay in North Lodge. (8th Feb 2019) We have just reopened the cottage after carrying out an extensive refurbishment, sadly after your stay had completed, which included new seating, other furniture and repainting throughout. We hope that next time you come to stay you will immediately notice the difference! Hi. We've been to this cottage for years now. It's the perfect place to get away from work and your busy life for a few days. Set only a mile away from the beautiful village of Finchingfield, the pub is only a short walk. Look at the photos on the website and read the reviews. You won't be disappointed. The house is situated on a quiet road, on its own. It's surrounded by countryside, but within easy walking distance of thre pretty village of Finchingfield for places to eat and drink. The house is very well appointed - the owners have thought of everything you're likely to need on a short break. Excellent Weekend but not at the cottage in the picture! We had an excellent weekend at North Lodge, but that's not the one shown in the picture. North Lodge was very clean and tidy, good welcome pack and furnished to a good standard. We enjoyed ourselves although it was a bit windy. A couple of suggestions - four tall (large) glasses would be good, also the TV was a bit on the small side. Would book again. North Lodge is just perfect! Everything you could wish for and more! We booked North Lodge as a base for our daughter's wedding in Steeple Bumpstead and reception on their family farm in Cornish Hall End. From the seamless booking to excellent and helpful communication with Archie and then the home comforts and luxury of an exceptional stay we can only highly recommend. The bride and bridesmaids got ready at the lodge and everything was just perfect for them from the convenient high hook in the bedroom for the wedding gown to the post code that brought the florist straight to the door! Ample parking allowed for our cars and my daughter's Series 2A Landrover which she drove herself to the church in! Thank you for helping to make it a perfect stay and perfect wedding. My sister in law from Johannesburg, South Africa, who stayed with us, wished she could make it her permanent home! We will certainly be back and will highly recommend to others.